So now that everyone is updated on what I haven't been posting for the last couple of weeks, let me start catching up by continuing my Salad 101 posts. I have covered How-to's on Cleaning & Storing Salad Greens, Types of Salad Greens & Tossing and Adding the Dressing. Now I will FINALLY be sharing the recipes :D .. Since I embarked on this salad making journey, I have been experimenting with various types of greens, fruits, dressings & seasonings, and have finally achieved the balance that my family loves. My basic rule is that salad greens will form the base of the salad, along with some fruit to provide the sweetness, along with some citrus to provide tang. Other vegetables can be added to make the salad more filling, nuts can be added for crunch, and proteins like chicken & cottage cheese can be added to make it more of a main course than a salad. sumac (optional)Note: The dressing is also not a typical vinaigrette - I reduced the olive oil & added yoghurt for some creaminess. 1. Toss the fruit (apples & oranges) with some lemon juice. 2. Blend the ingredients for the salad dressing in a blender for 30 seconds till it is creamy. Alternatively you can add all the ingredients and whisk for about a minute. Taste & adjust seasonings if required. 3. Take a big salad bowl and add salad greens, baby spinach & rocket/arugula. You can increase/decrease the quantity of the specific type of salad green based on personal preference. 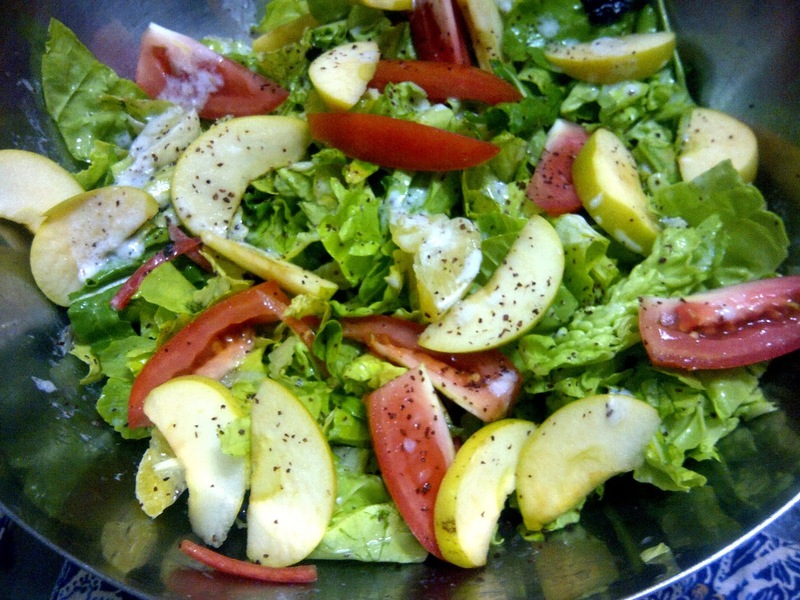 4.Toss the salad greens together with 2 tbsp of the dressing. Adjust and add more dressing if required. 5. Add apples, carrots & oranges. Add 1 tbsp of the dressing and lightly toss. If you want to save the salad for the next day, then add the salad dressing individually into your plate otherwise the salad will start wilting once the dressing is added.